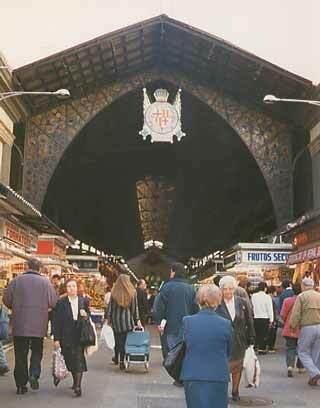 This first picture shows the entranceway to the Mercat de la Boquería, the central market that is just off the Rambles. It's an incredible place, full of every kind of fruit, meat, fish, or whatever you might happen to need. It took me a long time to get up the nerve to actually take a picture there. You might say I'm kind of a chicken, but since I lived there, it was just sort of strange. Do you take pictures of your supermarket?